The turbulent 1980s for Doctor Who reached its lowest and most fraught period during the reign of Sixth Doctor Colin Baker, when the BBC’s antagonism towards the show was at its most intense and the then 22-year-old series was even temporarily cancelled between Baker’s first and second seasons. In the midst of much behind-the-scenes chaos, the show’s on-screen quality wavered more than ever, despite consistently strong work from Baker himself. 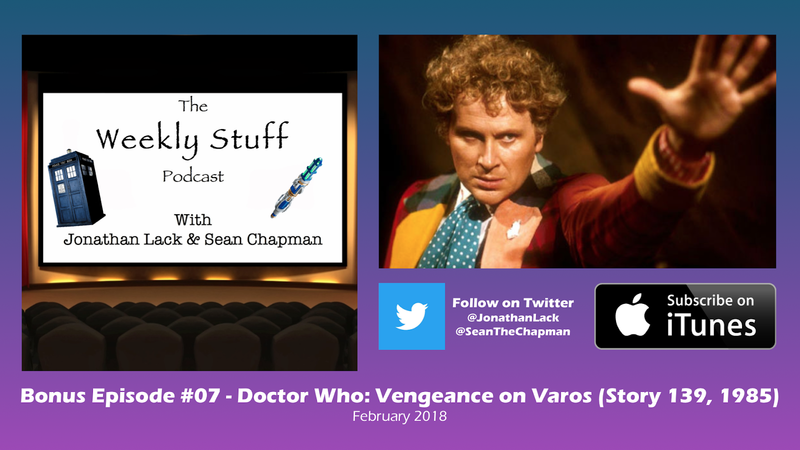 At least one true diamond-in-the-rough can be found in this era, and it’s the story we’re discussing today: “Vengeance on Varos,” the Sixth Doctor’s third story and one of Doctor Who’s darkest and most overtly political hours. The story itself, and the tale of the series’ desperate fight for survival during these years, makes for one of our most interesting bonus podcasts to date. Oh, and we also talk about “Doctor in Distress,” a megagroup-style charity single designed to rally public support for the series after its first cancellation. 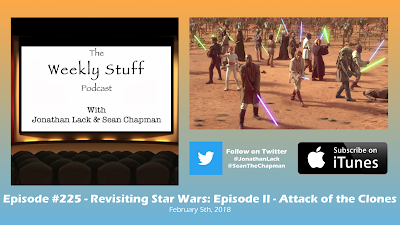 It is an absolute trip and you’re going to want to watch it before listening to this episode. 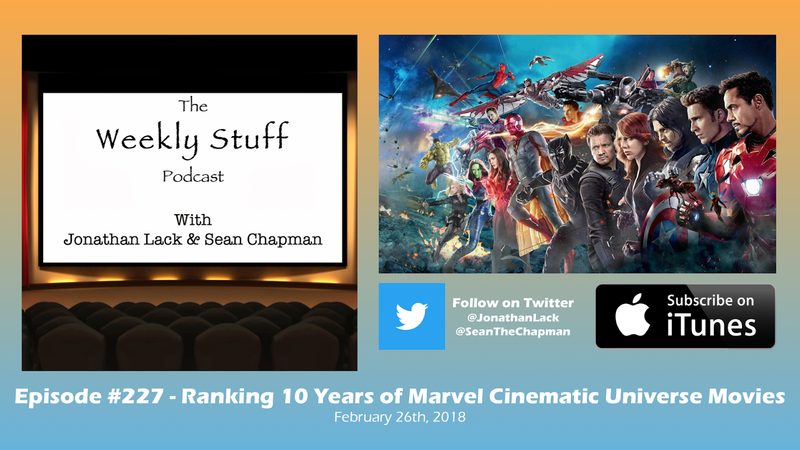 With Black Panther continuing its stunning box-office run and dominating pop culture conversations, we thought this might be a good week to look back at the 10-year history of the Marvel Cinematic Universe that brought us to this point, the journey that began way back in May of 2008 with the original Iron Man. We talk about what it’s been like to follow (and, for this podcast, cover) 10 years of this Hollywood-changing phenomenon, and in classic Weekly Stuff fashion, we also rank all 18 movies released under the Marvel Studios banner thus far, creating in real-time our ‘definitive’ podcast rankings of all the films. 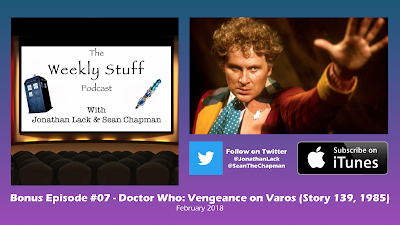 We also cover a small piece of Doctor Who news, grapple with Joss Whedon’s complicated legacy in a conversation triggered by his leaving DC’s Batgirl project, and at the very end, talk about how baffling it is to see the argument against ‘violent video games’ back in the mainstream again from America’s highest office. 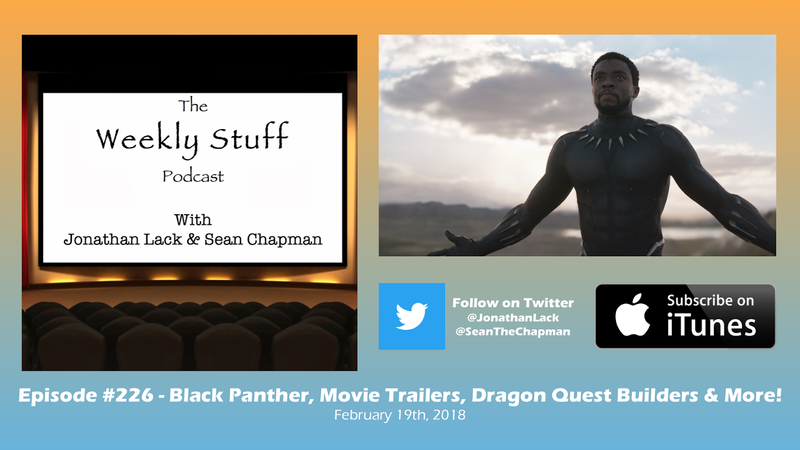 The Weekly Stuff #226 – Black Panther, Movie Trailers, Dragon Quest Builders, and much more! It’s the movie sensation that’s gripping the nation: Ryan Coogler’s Black Panther is finally here, and it’s one of the best, most artistically accomplished, and most culturally significant superhero films ever made. We give it our usual in-depth treatment, diving into everything that makes this film such a thoroughly special, rewarding entry in Marvel’s ever-expanding cinematic canon. We also catch up on two weeks’ worth of news, movie trailers (like Solo and Venom), and stuff, including Jonathan’s adventures with Dragon Quest Builders on Switch and Sean’s time going back and forth between Dragon Ball FighterZ and Dragon Ball Xenoverse 2.